Drug cartels on federal land pose enormous environmental and financial costs. Surrounded by national forest land, Abby and Jeff Delaney live in a part of Northern California so remote that she and her handful of neighbors have no cellphone service, and some are off the grid. In the spring of 2016, the Delaneys discovered there was a drug cartel growing marijuana nearby: About 2,500 plants were scattered through the forest, connected by long vines of irrigation line used to transport water from springs, creeks and manmade water catches to water the plants, as well as a makeshift kitchen and sleeping quarters. After investigating the rogue marijuana grow, the Delaneys had the unsettling realization that the growers could see right into their yard. To protect their safety, the couple has requested the use of a pseudonym. A drug cartel — a vast underground crime network typically associated with a roster of criminal activity, including murder, drug trafficking, coercion and kidnapping — had covertly installed a network of marijuana farms on federal land, less than a quarter mile away from their home. 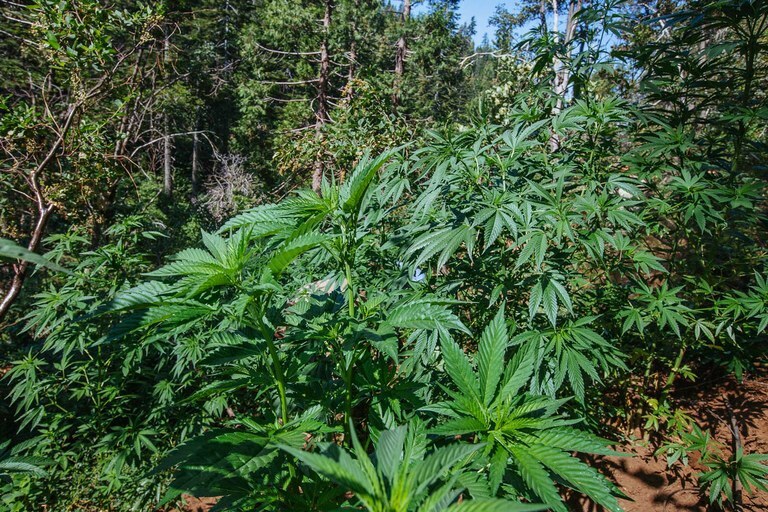 The Delaneys own a bucolic plot of land that butts up against the dense green Shasta-Trinity National Forest in Trinity County, one of the three points, along with Humboldt and Mendocino counties, of California’s notorious “Emerald Triangle,” an epicenter of marijuana production. Alongside the estimated 50,000 private-land marijuana grows that stud the landscape, a parallel industry of organized crime is thriving clandestinely on public land. Operated primarily by Mexican drug cartels, trespass marijuana grows on national forest lands are estimated to number in the hundreds of thousands in California alone, producing millions of pounds of marijuana that are absorbed into the U.S. black market every year. Whether legal or illegal, marijuana cultivation can have environmental impacts, but trespass grows are a uniquely challenging problem, destroying public lands and devouring millions in federal funds every year. As the Delaneys would discover, Forest Service districts are fighting a losing battle. Some of them feel so overwhelmed that they no longer try to intervene. As soon as Abby Delaney realized that the grow site was connected to two others, she began contacting Forest Service law enforcement and district offices, making at least four phone calls and sending emails, but receiving no response. According to her, a Forest Service law enforcement officer — who declined to comment for this story — finally replied to her months later, promising that the site would be cleaned up. The resident growers left in late fall following the harvest, but the remediation never happened. The Delaneys waited, anxiously wondering if the growers would return. And then, in the spring of 2017, they did. 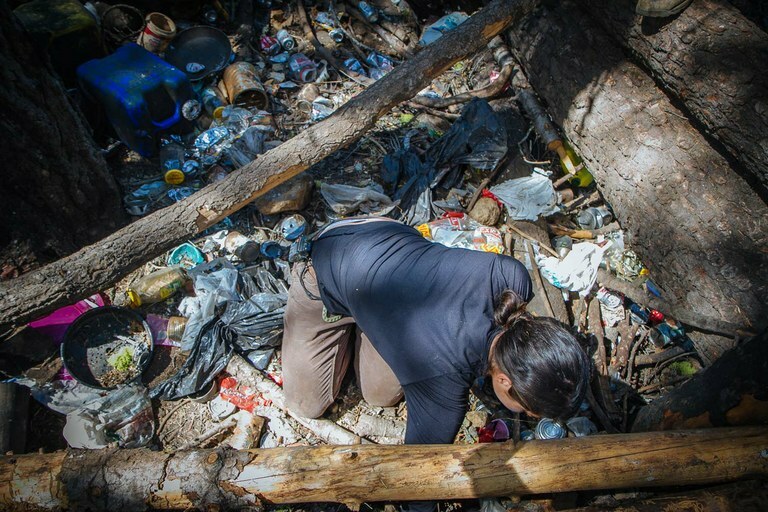 Corrina Kamoroff, an associate ecologist working for the Integral Ecology Research Center begins cataloging the refuse found at a camp in Plumas National Forest, California, as part of a long-term documentation of marijuana cultivation's environmental impacts. Grower's camps contain month's worth of living and farming supplies, including food, pesticides, rat poisons and irrigation tubing. Bears, coyotes, fox, fishers and all number of animals rummage through the garbage left behind, often falling victim to poaching, poison traps, and containers of toxins discarded around the site. An invisible battle for territory is being waged on our federal lands. Mexican drug trafficking organizations have been growing pot on federal forests for decades, but since the early 2000s, the number and size of grows have been increasing every year as they vie for control of production, operating trespass-grow sites throughout the Pacific Northwest, as well as in Colorado, Utah, Nevada, Arizona and New Mexico. To manage commodity production at this scale, Trujillo reports that cartels have staging sites throughout California that organize labor pools, transportation and supplies — from San Luis Obispo all the way up to Red Bluff and Humboldt County. The supplies are stealthily funneled through the remote forest terrain into grow sites run by three to four men on average, with up to 10 to 20 during harvest. The work is brutal, requiring hiking, hauling supplies and living in the wilderness under primitive conditions. But the workers can earn between $100-$300 a day, so there’s never a shortage. “It’s a gang mentality, and they’re out there in the woods,” says Trujillo. Many of the workers are linked to the Mexican states of Jalisco or Michoacán, the far end of a supply chain producing marijuana that is primarily sold in states where the drug is still illegal and fetching high prices. A trail of staggering environmental destruction cuts through the heart of the problem. Trespass grow sites wreak havoc on the land, leaving behind hundreds of thousands of pounds of garbage, leaching caustic chemicals, polluting watersheds, and damaging the habitat of endangered and at-risk species. Forest Service Law Enforcement estimates that half of trespass grow sites utilize toxic pesticides and fertilizers that are banned in the United States, most notably Carbofuran, a pesticide that is deadly by the teaspoon but used by the gallon on these sites. These toxins have been found in the water, and they move through the food chain, poisoning and even killing some species, such as the imperiled Pacific fisher, a forest-dwelling carnivore. “It’s a huge issue,” says Forest Service Law Enforcement Officer Stephen Frick. Last year, Forest Service Law Enforcement officers raided 246 sites in California at a cost of almost $2.5 million, a figure that doesn’t include the actual cleanup of illegal grows. Cleanups are tasked to the agency’s regional districts. But after several years of implementing cleanups in partnership with natural resource nonprofits and state agencies, in 2016 the Shasta-Trinity National Forest hired two private contractors, the National Response Corporation and Engineering Remediation Resources Group. The price tag for these contracts averages between $20,000 and $70,000 per site just to remove the hazardous materials, leaving behind the infrastructure, such as the soil and water lines, and the garbage generated by the illegal growers. “They’re very, very expensive,” says Mourad Gabriel, a wildlife biologist and the executive director of the Integral Ecology Research Center, a nonprofit that spearheads the tracking and cleanup of trespass marijuana grows. “The problem is that you’ll get a site that will cost $20,000, even $50,000 to contain, transport and dispose of maybe no more than a couple gallons of material.” Comparatively, Gabriel says that the cost for his organization to conduct a full cleanup ranges between $5,000 and $18,000 per site, including the removal of garbage and infrastructure. In an effort to access financial records on private cleanup contracts, High Country News filed a Freedom of Information Act request with the Forest Service, but were told via email that this was not information they track. The Forest Service also failed to provide copies of the contracts. David Meyers, district supervisor of the Shasta-Trinity National Forest, defends the decision to hire private contractors. It's a response, he argues, to the lack of personnel trained to deal with hazardous materials. “The priority is getting the (chemicals) off those sites because they will continue to kill wildlife and contaminate the water and soil,” says Meyers, even though he acknowledges that the private contractors lack the necessary wildland experience. The shift to high-priced cleanup contractors has come with a stall in cleanup work, with the Shasta-Trinity National Forest Service floundering under a solution it can’t seem to afford. Its cleanup rate has plunged from 51 sites in 2015, to five in 2016. So far in 2017, there have been approximately four or five sites. Even though more cleanups will be needed this year, the financial forecast looks grim: Meyers estimates just $25,000 remains in the budget for remediation. This costly environmental issue comes at a time when the Forest Service budget is anticipated to drop by $970 million, from $6.1 billion to $5.1 billion, with a current national budget for remediation between $13 million to $14 million that is split between all the regions. Meyers reports that his region is working on developing a more cost-effective model for cleanups, possibly involving training their own crews, but he was unable to offer any concrete details. A grow that was raided on Aug. 10, 2016, in Plumas National Forest, included more than 7,000 plants, and would be considered a relatively small grow. Since the plants had not yet gone to bud, the team left them to wither and dry in the sun. This spring, just as the Delaneys feared, the cartel returned to grow illegal marijuana behind their home. The site closest to their house remained unoccupied, but the two adjacent ones were inhabited for much of the year until this August, when they were raided and two arrests were made. Yet the federal government’s failure to fully address this expansive threat is reverberating far beyond the forest. For the Delaneys, a complex of marijuana grows was left to leach caustic chemicals into their watershed for over a year. “The problem is that all those hazmats weren’t cleaned up, and so we’re worried about water quality, because our spring comes from up there,” says Abby Delaney. The site closest to them is still haunted by ghost-like rotted marijuana plants, piles of garbage and barbed wire fences. Pesticides are most likely still seeping into the ground and water. The infrastructure that was left behind is a problem, too: According to Gabriel, 80 percent of sites that are left intact end up being reused. All the cartels have to do is move the workers and the supplies back in. This point is not lost on the Delaney family, still living with a ready-made trespass grow site right behind them. “Perhaps those growers will come back,” Abby Delaney says. “We don’t know.” It is a worrisome thought, and the couple feels helpless. Officials from the Shasta-Trinity District say they are developing cleanup strategies that could become the model for other districts. But after a two-year drop in higher-price reclamations and no specifics for a path forward on the horizon, the outcome is still a big question. And the future remains uncertain for the health of the forest — and for all those who live in it or near it, both the human and wild inhabitants.